Most science classes, including biology, start with an introductory lesson on the nature of science. 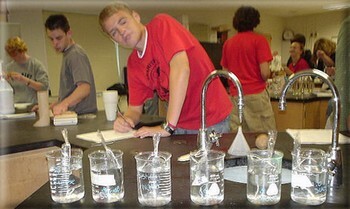 The scientific method is an integral part of all science classes. Students should be encouraged to problem-solve and not just perform step by step experiments. Significant Figures – An activity that looks at uncertainty in measurements, comparing rulers with different values. What is the Effect of Exercise on Heart Rate – aligned to NGSS, feedback mechanisms and homeostasis. Students design and conduct an experiment. Interpreting Graphs – shows a pie chart with grades, a scatter plot, and a few line graphs with questions to answer about each. Data Collection is Fun(gi) – use notes gathered in a field journal to create a data table to organize information about fungi and graph the relationship between fruiting body size and number. Scientific Method Flowchart– this flow chart can be used for any experimental design. Students organize their experiment, identify the controls and variables, collect data and draw conclusions.